Salt has always been a valuable commodity. From preserving meat and fish to enhancing the flavor of cooked foods to enticing wild game out into the open, salt has a permanent place in human history going back millennia. And so wherever the configuration of sea and shore facilitate the large-scale evaporation of sea water over the shallows leaving sea salt behind, humans have taken advantage. One such place is outside of Gruissan along the Mediterranean coast not far from Narbonne. Salt has been harvested there for generations, hundreds if not thousands of years. 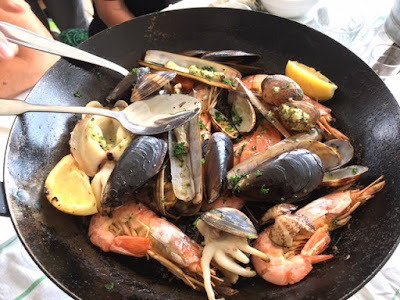 There are restaurants at destinations, restaurants that benefit from their location in an area that attracts tourists, and there are destination restaurants, restaurants that are sufficiently interesting in and of themselves to warrant going a bit out of your way to make a special visit. 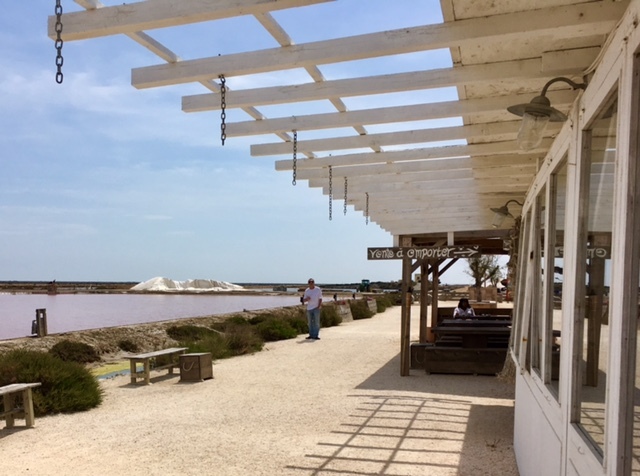 La Cambuse du Saunier on Gruissan's salt flats is a bit of both. 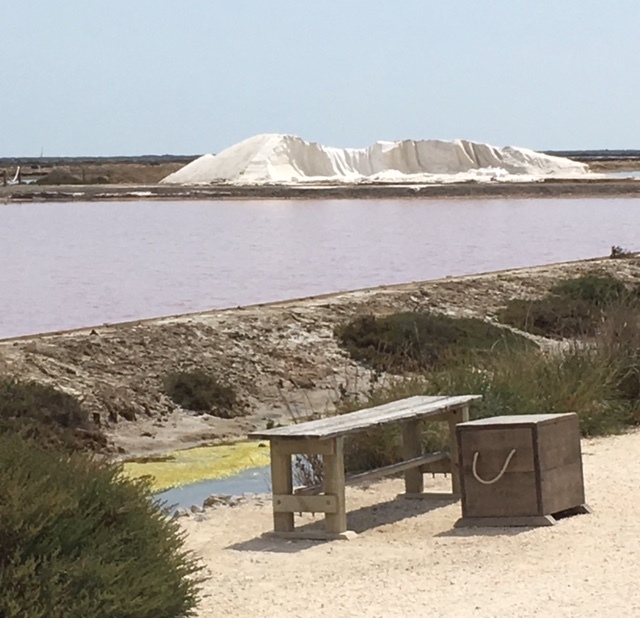 Uniquely situated directly adjacent to the salt flats, the sight of the pink-tinted drying pools and impressive mounds of harvested salt are almost worth the trip in themselves. Add a gift shop that features all sorts of salty stuff, the wines of the region, displays of tools used in the harvest now and in the past, and a tiny theater showing a short video describing the harvesting process and you really don't need to stop by the restaurant to enjoy your visit. 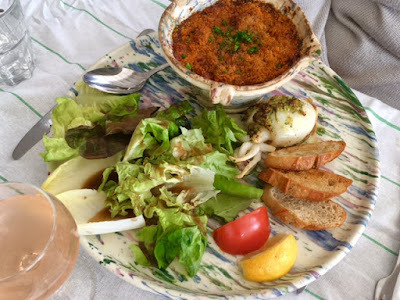 La Cambuse is a restaurant at a destination. But wait. There's more. La Cambuse presents varieties of seafood not always available even in local seafood restaurants. 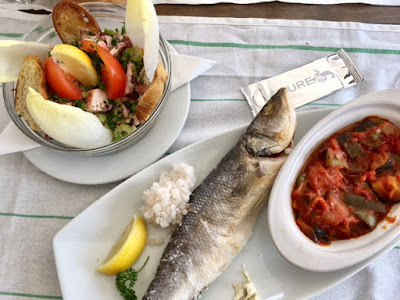 And many of the main dishes are baked in salt, giving both fish and meats unique flavors. For these and other reasons, La Cambuse is a destination restaurant. As high season approaches, reservations are mandatory. When our party of five arrived, we were directed to one of a series of long picnic tables with benches where five places had been set. Our server greeted us with a very tasty, sweet aperitif, a small taste of rose wine that had been steeped with orange peels and fortified with anisette. We were given menus and a slate of the day's specials. Our orders came from both. 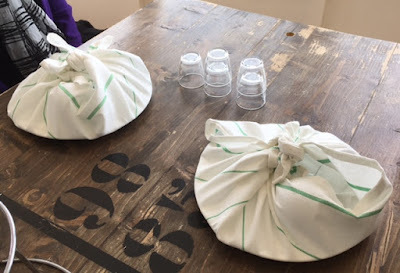 We began by sharing a dozen oysters and a dozen shrimp. The oysters were plump and briny, the shrimp sweet and mild. Four of our group chose the salad with bits of octopus, a full portion and well designed and executed. 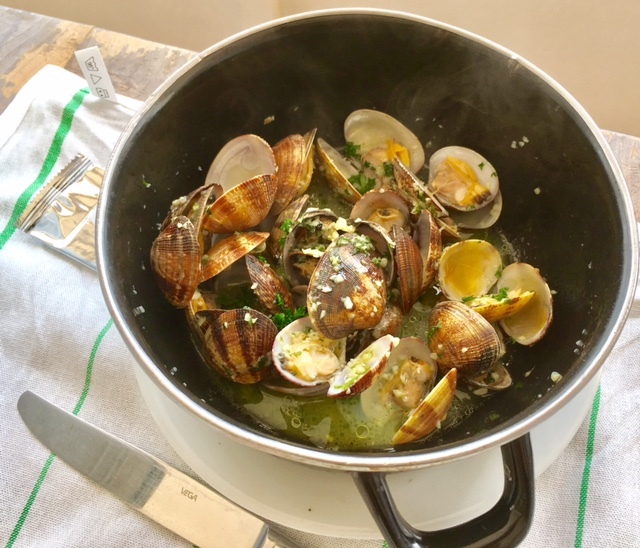 I had a bowl full of small, steamed clams with lots of butter and garlic. Yum! 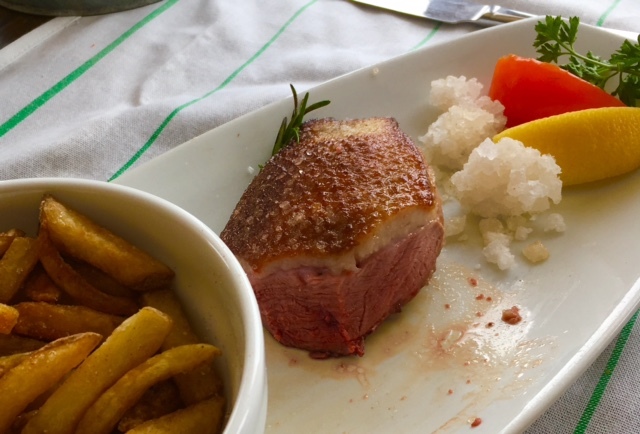 Three of us chose main courses baked in salt - two had the sea bass and I had a duck breast. The fish, fully intact, came encrusted with salt. But once the skin had been peeled away, the ladies reported that there was no particular salt taste to the flesh which had survived moist and flavorful. My duck did carry the taste of the salt with it, different and interesting without being overpowering. The other two mains were a cassoulet featuring seche and a seafood assiette with a wide variety of forms and tastes, from razor clams to shrimp and more. All very satisfactory. We were too full for dessert but three of us went for coffee. With a bottle of rose and a bottle of white en pichet the tab came to just over 200 euros for five. We found that a bit hefty. And there was a mix up with our order. Two mains were served at the same time as the starts and the other three arrived some time later. Apologies but no adjustments. In sum, our visit to La Cambuse du Saunier was interesting and informative, with new sights and tastes. But given the value for dollar, this restaurant will not go into our regular rotation, either for ourselves or for visiting travelers. True foodies, maybe. But that's about it.